Download the document from the Cloud. Save the document inside your Harmonia Folder. Open the downloaded document in a new Harmonia window. When you select an assignment (practice or homework) in the Cloud menu, Harmonia downloads and saves the document as a .har file in your Harmonia folder and then opens that file for you automatically inside a new Harmonia window. The name of the assignment document is visible to you in the Title bar of its Harmonia window. As you work to complete your homework you can periodically save your changes using the File▸Save command. If you save your changes, you can always quit Harmonia, restart the app at a later time, the reopen the assignment continue to work. Double-click the .har file to open the document in a new Harmonia window. 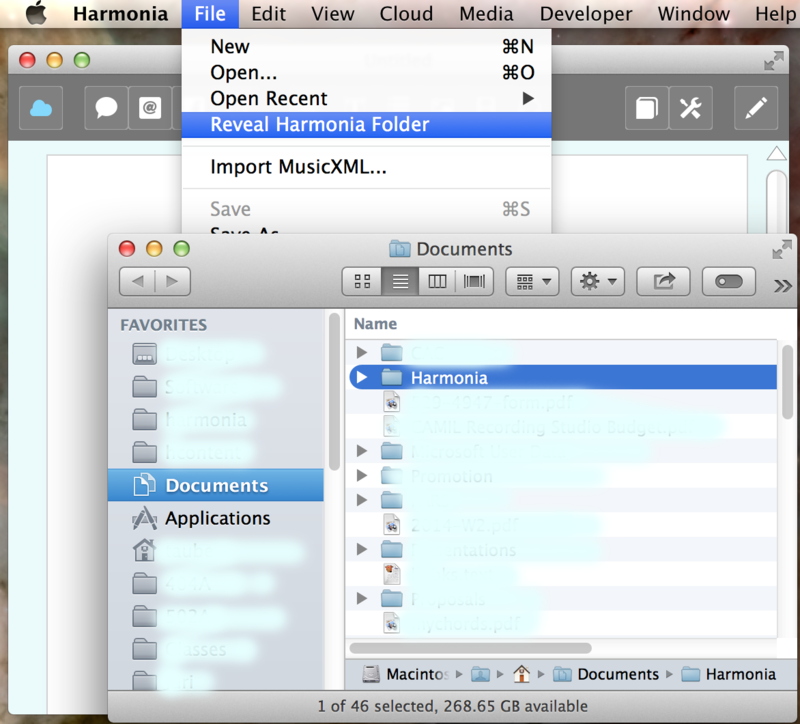 Use File▸Open... to locate the file on your hard drive and open it in a new Harmonia window . Use the File▸Open Recent▸ menu to open one of the listed files in a new Harmonia window. Drag the file from its location on your computer's hard drive onto the app's program icon. Drag the file onto any visible Harmonia window, this will open the assignment in a new window in Harmonia. Downloading a new version of an assignment will never overwrite an early version. Instead, the file name of the new version include a number in parentheses affixed to the end of the file name, e.g Intervals Assignment(2).har. You might have occasion to use Harmonia on two different computers. Remember that each computer you use will have its own Harmonia folder and that once you download an assignment you've downloaded it to one particular machine. That means you should either complete the assignment on that machine, or copy the assignment file onto a thumb drive and transfer it to the other machine's Harmonia folder. The document's background is tan rather than aqua. The window's topbar will include a red Check button that allow you to grade the document once you have filled it out. If the assignment is timed the top bar will include a digital stopwatch that lets you start the exercise and shows you how much time remains. Depending on the course and instructor, your assignment material may include both practice assignments and homework assignments. From a usability perspective there is no real difference between practice and homework: the assignments look the same, both are filled out the same way, and both are graded. The only real difference is that a homework grade will count towards your overall course grade, while practice grades are never figured into this calculation. A practice assignment can be retaken multiple times. A homework assignment is (typically) completed just one time. A practice assignment often randomizes its items when retaken. A homework assignment is (typically) not randomized. A practice assignment cannot be saved to a file in Harmonia. A homework assignment can be saved whenever you want. When a practice assignment is graded its grade report is instantly available to you. Depending on how your teacher has configured the assignment, viewing a homework assignment's grade report might be delayed until a certain 'completion date' that your teacher has established.